We fabricate steel casings, bag filters as per Client requirement. Our company is most trusted and acknowledged in the field of offering Steel Case Box throughout the market. Accuracy : 1.6% 8- 2.5% F.S. Upto 13-5/8 (346.08 mm) 0.D. 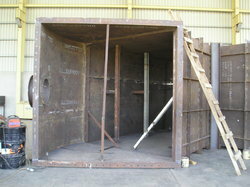 We are manufacturing CKD & CBU Steel Cases for export purpose. Our products are well known for their toughness, strength and durability. We provide our customers with high quality value added services. We are manufacturing high quality products of Steel case W344G. Stainless steel sterilizing case with two silicon mats.